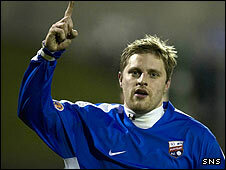 Montrose set up a lucrative Scottish Cup visit to Hibernian after overcoming a spirited Edinburgh City. Steven Nicholas turned his man to fire the visitors ahead on 20 minutes but Dougie Gair levelled before half time after some slack defending. John Maitland headed the Third Division strugglers ahead again after John Gemmell's shot had hit the post. Montrose substitute Daryl Nicol wrapped the tie up on 84 minutes following a mazy run from inside his own half. 90:00+1:59 The referee ends the match. 90:00+1:36 Daryl Nicol produces a left-footed shot from just outside the box that goes wide left of the goal. 89:13 Substitution John Gemmell leaves the field to be replaced by Jordan Leyden. 88:17 Outswinging corner taken left-footed by Dougie Gair from the left by-line, Andrew McNeil makes a save. 87:31 The ball is sent over by Ross MacNamara, save by Andrew McNeil. 84:48 Outswinging corner taken from the left by-line by Dougie Gair, clearance made by Sean Crighton. 84:23 Outswinging corner taken left-footed by Dougie Gair from the left by-line, clearance by Steven Tweed. 83:17 GOAL - Daryl Nicol:Edinburgh City 1 - 3 Montrose Daryl Nicol grabs a goal from inside the box to the bottom left corner of the goal. Edinburgh City 1-3 Montrose. 81:17 Substitution Marek Tomana replaces Sean Fleming. 81:04 Direct free kick taken by Alan Cambell. 81:04 Substitution Danny Denholn goes off and Ross Guthrie comes on. 81:04 Foul by Michael Bruce on Steven Nicholas, free kick awarded. 80:10 Corner taken by Dougie Gair from the left by-line, clearance made by Steven Nicholas. 79:15 Ross MacNamara takes the free kick. 79:15 Booking Christopher Hegarty goes into the book. 79:07 Christopher Hegarty challenges Danny Denholn unfairly and gives away a free kick. 77:34 Ian McFarland has a volleyed shot. Save by Andrew McNeil. 77:00 Fraser Milligan concedes a free kick for a foul on Steven Clee. Dougie Gair crosses the ball from the free kick right-footed from left channel, clearance made by Steven Tweed. 76:31 A cross is delivered by Steven Clee, save by Andrew McNeil. 75:35 Foul by John Gemmell on Shaun Harrison, free kick awarded. Duncan Montieth takes the free kick. 74:31 Substitution Daryl Nicol on for John Maitland. 73:34 Ian McFarland has an effort at goal from outside the box which goes wide right of the target. 73:13 Steven Nicholas concedes a free kick for a foul on Shaun Harrison. Shaun Harrison takes the free kick. 72:18 John Gemmell concedes a free kick for a foul on Kenny Ross. Duncan Montieth restarts play with the free kick. 70:11 Hugh Davidson provided the assist for the goal. 70:11 GOAL - John Maitland:Edinburgh City 1 - 2 Montrose John Maitland finds the net with a headed goal from close range. Edinburgh City 1-2 Montrose. 69:31 The ball is delivered by John Maitland, John Gemmell has an effort at goal from deep inside the box hitting the post. 67:41 The ball is sent over by Alan Cambell, clearance by Michael Bruce. 67:06 John Gemmell concedes a free kick for a foul on Ross MacNamara. Duncan Montieth takes the direct free kick. 66:37 Free kick awarded for an unfair challenge on Steven Tweed by Steven Clee. Andrew McNeil takes the direct free kick. 64:56 Unfair challenge on Dougie Gair by Fraser Milligan results in a free kick. Free kick crossed left-footed by Dougie Gair, clearance made by Alan Cambell. 64:22 A cross is delivered by Ian McFarland, Andrew McNeil makes a save. 63:54 Outswinging corner taken left-footed by Ian McFarland from the left by-line, clearance by Steven Tweed. 62:33 John Gemmell fouled by Ian McFarland, the ref awards a free kick. Christopher Hegarty has an effort direct from the free kick. 60:45 Steven Nicholas has shot on goal from just outside the penalty box which goes wide of the right-hand upright. 60:04 Substitution Steven Clee on for Peter Stenhouse. 56:37 John Maitland sends in a cross, Michael Bruce manages to make a clearance. 54:32 A cross is delivered by John Gemmell, Ross MacNamara gets a block in. 53:54 Free kick awarded for a foul by John Gemmell on Ross MacNamara. Ross MacNamara takes the free kick. 52:05 Steven Tweed takes the direct free kick. 52:05 Booking Michael Bruce is cautioned. 51:52 Free kick awarded for an unfair challenge on Sean Crighton by Michael Bruce. 50:02 Shot by Christopher Hegarty. Duncan Montieth makes a save. 47:10 The official flags Peter Stenhouse offside. Free kick taken by Andrew McNeil. 46:23 Direct free kick taken by Shaun Harrison. 46:23 Booking Steven Tweed is shown a yellow card for unsporting behaviour. 46:10 Steven Tweed concedes a free kick for a foul on Ian McFarland. 45:48 A cross is delivered by Kenny Ross, Jordan Caddow takes a shot. Save by Andrew McNeil. 45:25 The ball is sent over by Shaun Harrison, Fraser Milligan makes a clearance. 45:00+1:00 The ref blows to signal half-time. 45:00+0:35 Peter Stenhouse produces a right-footed shot from deep inside the penalty box which goes wide of the right-hand upright. 44:16 Corner taken left-footed by Dougie Gair from the left by-line, Alan Cambell manages to make a clearance. 44:06 The ball is delivered by Ian McFarland, clearance by Steven Tweed. 43:56 Shaun Harrison crosses the ball, clearance made by Alan Cambell. 41:16 The ball is delivered by Shaun Harrison, save by Andrew McNeil. 39:28 Andrew McNeil takes the direct free kick. 39:28 Booking The referee cautions Shaun Harrison for unsporting behaviour. 39:13 Free kick awarded for an unfair challenge on John Gemmell by Shaun Harrison. 37:42 Effort from outside the penalty area by Dougie Gair goes wide left of the goal. 36:34 GOAL - Dougie Gair:Edinburgh City 1 - 1 Montrose A goal is scored by Dougie Gair from inside the penalty area to the bottom right corner of the goal. Edinburgh City 1-1 Montrose. 36:08 Inswinging corner taken by Christopher Hegarty, Michael Bruce makes a clearance. Correction - 34:05 Shot comes in from Christopher Hegarty from the free kick. Steven Nicholas delivers the ball, clearance made by Michael Bruce. Fraser Milligan crosses the ball, Shaun Harrison manages to make a clearance. Correction - 34:05 Booking Ross MacNamara shown a yellow card. 34:05 Christopher Hegarty has a direct shot on goal from the free kick. The ball is swung over by Steven Nicholas, Michael Bruce makes a clearance. Fraser Milligan sends in a cross, Shaun Harrison makes a clearance. 34:05 Booking Michael Bruce is given a yellow card. Correction - 33:52 The referee penalises Ross MacNamara for handball. 33:52 Michael Bruce is adjudged to have handled the ball. 32:37 Free kick awarded for a foul by Michael Bruce on Steven Nicholas. Sean Fleming shoots direct from the free kick, Michael Bruce gets a block in. 32:11 Shaun Harrison delivers the ball, Andrew McNeil makes a save. 31:05 Scott MacFarland produces a cross. 30:34 Outswinging corner taken from the right by-line by Scott MacFarland, clearance made by Steven Tweed. 30:28 The ball is sent over by John Maitland, clearance made by Kenny Ross. 29:45 Dougie Gair fouled by Sean Crighton, the ref awards a free kick. Michael Bruce takes the direct free kick. 28:40 Outswinging corner taken by Christopher Hegarty from the right by-line, Close range headed effort by John Maitland goes wide of the left-hand upright. 27:07 Sean Crighton concedes a free kick for a foul on Ian McFarland. The free kick is delivered right-footed by Ross MacNamara from left channel, Christopher Hegarty makes a clearance. 26:38 Booking Sean Fleming is given a yellow card. 25:15 Ian McFarland gives away a free kick for an unfair challenge on Steven Nicholas. Free kick crossed right-footed by Christopher Hegarty from left channel, save made by Duncan Montieth. 24:47 John Gemmell has an effort at goal from just outside the box which goes wide of the left-hand upright. 23:24 The referee blows for offside. Duncan Montieth takes the indirect free kick. 21:29 Christopher Hegarty decides to take a short corner. 19:31 GOAL - Steven Nicholas:Edinburgh City 0 - 1 Montrose Steven Nicholas grabs a goal from the edge of the area to the bottom left corner of the goal. Edinburgh City 0-1 Montrose. 17:25 The referee blows for offside against Alan Cambell. Indirect free kick taken by Duncan Montieth. 16:54 Shot from just outside the box by Sean Fleming goes over the crossbar. 16:30 Outswinging corner taken by Sean Crighton from the right by-line, Ross MacNamara makes a clearance. 15:26 Kenny Ross gives away a free kick for an unfair challenge on John Maitland. Strike on goal comes in from Sean Crighton from the free kick, save by Duncan Montieth. 15:12 Alan Cambell crosses the ball, Kenny Ross makes a clearance. 14:29 Steven Nicholas gives away a free kick for an unfair challenge on Duncan Montieth. Direct free kick taken by Duncan Montieth. 13:10 Corner taken left-footed by Steven Nicholas, Ross MacNamara manages to make a clearance. 12:09 Sean Fleming takes a shot. Save made by Duncan Montieth. 11:47 Outswinging corner taken left-footed by Sean Crighton, Dougie Gair manages to make a clearance. 10:58 Inswinging corner taken left-footed by Dougie Gair, Peter Stenhouse has a headed effort at goal from close range which goes wide of the left-hand upright. 10:21 Ian McFarland takes a shot. Alan Cambell gets a block in. 10:14 The ball is delivered by Jordan Caddow, clearance made by Alan Cambell. 10:00 A cross is delivered by Jordan Caddow, Alan Cambell gets a block in. 8:56 John Gemmell has an effort at goal from 20 yards. Andrew McNeil makes a save. 6:44 Free kick awarded for a foul by Steven Tweed on Dougie Gair. Ian McFarland produces a cross, Headed effort from inside the box by Jordan Caddow misses to the right of the target. 5:55 Dougie Gair produces a cross, clearance by Steven Tweed. 3:48 John Gemmell takes a shot. Duncan Montieth makes a save. 2:34 The ball is crossed by Kenny Ross, clearance by Hugh Davidson. 1:24 Hugh Davidson takes a shot. Save made by Duncan Montieth. 0:38 Free kick awarded for a foul by Dougie Gair on Christopher Hegarty. Sean Crighton takes the direct free kick.